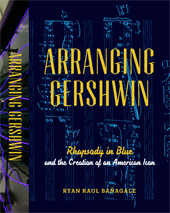 Thank you for visiting the companion site for Arranging Gershwin. Rhapsody in Blue comes alive through performance and interpretation. Here you will find not only a variety of recordings and performances of Rhapsody in Blue, but also various color figures and photographs. You are encouraged to peruse these materials while reading the book to provide as fulsome an experience of these multifaceted arrangements of the piece as possible.